Kitchen Clonc: MasterChef Quarter Final. Wow! What an utter roller coaster it has been over the last few days, culminating with me reaching the first quarterfinals of this series! It seems as if everything is a bit of a dream that even now, even after watching it I still can't quite believe it's happening! I knew that heading into the quarter finals I would have to up my game but I think it's fair to say that when the brief came through I was a bit torn. A choice between Chocolate with a twist or Indian Spices. My natural cooking style would lend itself more to the chocolate brief but on the other hand this would be an ideal opportunity to tap into my gastronomic heritage and finally learn about the food that has been eaten in my family for generations. A food style that up until now I didn't really cook. 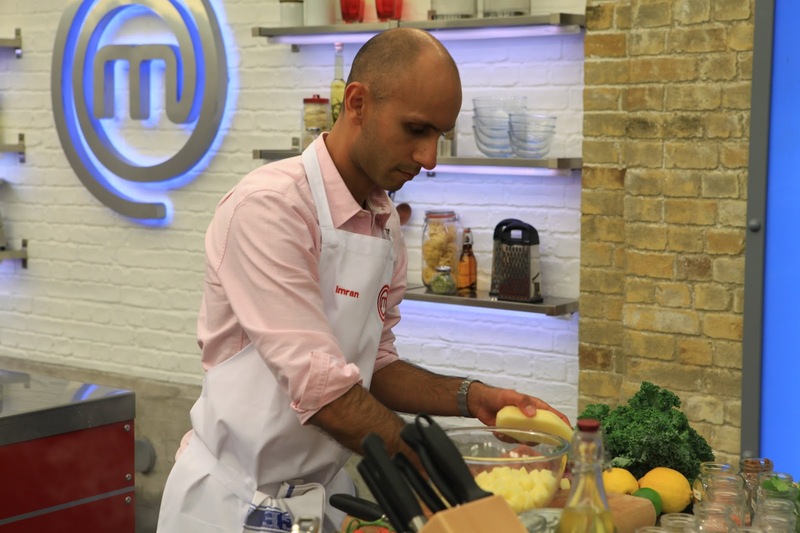 In my eyes this was the right way to go, so heading back into the MasterChef kitchen not only did I want to impress the judges but I also wanted to showcase how humble and homely Indian food can be delicious and beautiful too. The thali set up seemed to lend itself so well to what I wanted to demonstrate. Traditional food with some flair which came in the form of my kale pakoras and green apple kachumber. For the most part I think I achieved this, I was happy but it wasn't up to me! We didn't know who had set the brief but when we were told it was a food critic there was a palatable increase in tension in the room. Two judges was tough enough three was a whole new ball game let alone a food critic. I was stationed at the front, much less distance for me to worry about walking with my food to the judges. The feedback this time was so much better than before. Amol Rajan the food critic in question gave me some of the best critique I have had so far: "I've travelled the length and breadth of India looking for the perfect pakora and that's up there with some of the best of them" and "it looks very good, I'd be happy to pay for that in a restaurant". WOW! A fully respected and recognised food critic giving me that feedback was amazing and it meant so much to me for my food to be praised like that. Even John Torode joked he would like to nick the kale pakora idea for his book! Yes it wasn't all great feedback but I could have not done more, 6 elements to the dish in the time we had from scratch was certainly a push and the stakes were so much higher this round. Proving that I can do this and am worthy of my place as a quarterfinalist, representing the food of my upbringing well, not letting my mum down and a place in Knock Out Week! Pressure! The now familiar wait then followed as the judges came to a decision. I'm finding that quite hard to watch and listen to as the first time the viewer sees that is the first time I see that! The critique I've had face to face but their discussion is unknown to the contestants until it is on TV. It can be quite gut wrenching stuff especially when you have put your heart and soul into it. Decision made, line up time! Still trying to be calm the moment got the better of me, the silence, the long pause, the anxiety! Name after name called out, wishing and hoping they would call my name out and put me out of this agony. Down to the wire again! Then they call my name! A rush of mixed emotions, I don't think my heart can take this anymore! No time to think here comes the fizz, which was a cracking way to end an epic couple of days! Onward to Knock Out Week! I want to say thank you for all the support and love I have received. It is very much appreciated and you really have made this experience so amazing for me! Thank you!